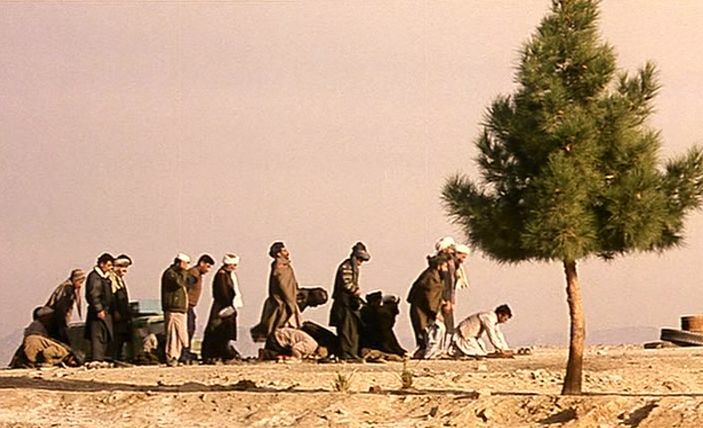 Like a number of other contemporary Iranian works, The Deserted Station (Istgah-Matrouk, 2002), a film directed by Alireza Raisian, presents mundane events and circumstances that manage to evoke larger themes concerning the lives of the characters. 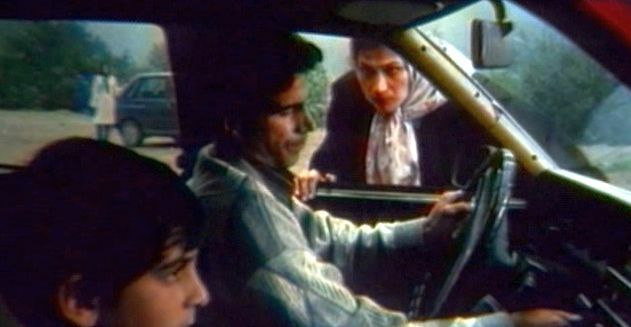 Reminiscent of earlier Italian films such as those by Michelangelo Antonioni, these Iranian films often involve an educated, urbanized protagonist for whom an encounter with ordinary people in the countryside elicits philosophical introspection about life's purposes. 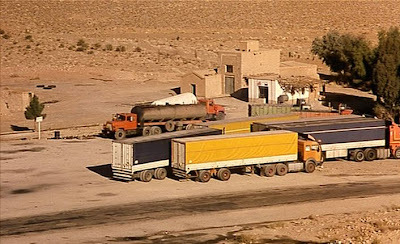 In the case of The Deserted Station, the story concerns a young married couple driving across eastern Iran on their way to making a devotional visit to the Imam Reza shrine in Mashhad. The film proceeds at a leisurely pace to acclimate the viewer to the slow pace and sense of isolation of the Iranian desert. In fact for the film's first six minutes, one only sees images of the desert road and the driver, who is always shown in a tight camera frame so that one can’t be sure if he there is anyone else in the car. Eventually one is able to see that there is a passenger, the driver's wife, who though never named, turns out to be the story's real protagonist. As they drive through the barren landscape of Semnan province during the early morning hours, the driver Mahmood, who is a professional photographer, wanders off the main road in pursuit of picturesque images to capture with his camera. When a deer surprisingly bolts in front of their car on the road, Mahmood’s wild swerve to avoid hitting it causes a mechanical break down. Suddenly in this desolate landscape they are in need of a repairman. 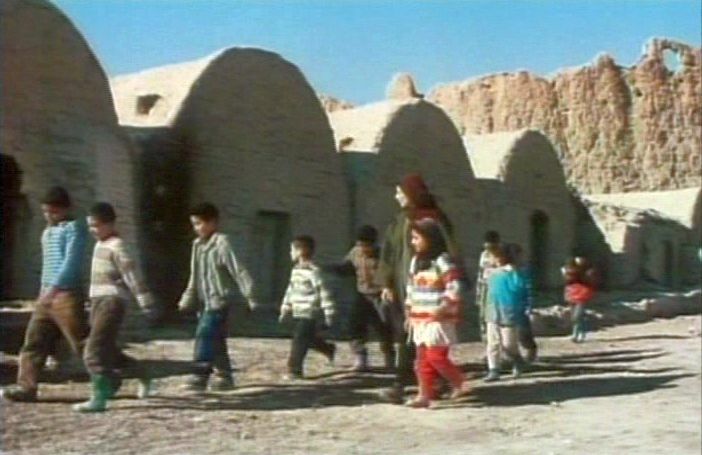 It turns out that the only evidence of nearby human habitation is a tiny mud-brick community inhabited almost exclusively by women and children. The men of the area, we are told, have all gone off to find work in other locations, and there is now just one remaining able-bodied male: a solitary local herder, Feizollah, who somehow manages to embody most of the traditional male-supplied services that are needed in the village. Not only is Feizollah the local handyman, he is also the only literate person, which means that if the fatherless children in the community are to get any education, he must be their teacher. Feizollah tells Mahmood that he can repair their car, but the two of them will need to travel by motorcycle to the regional service town in order to buy a spare part. This will take most of the day, so that in the meantime, Mahmood’s wife will have to look after the school children while the two men are gone. 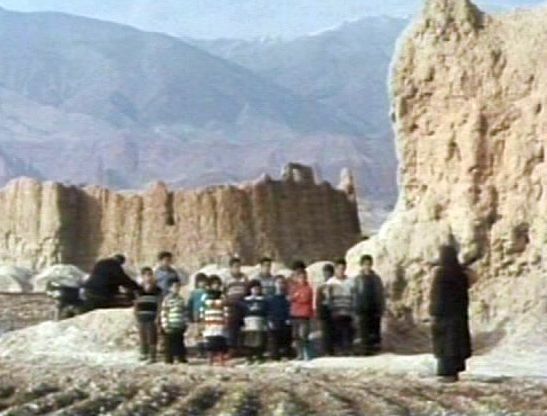 We will eventually see that here are about twenty children of various ages in Feizollah’s school, about 80% of whom are boys – girls in this village apparently tend to get married off to other villages at a very early age. Mahmood’s wife is hesitant she can take over the class so easily, but Mahmood assures her that she can do it and reminds her that she has taught classes before. The key element underlying this narrative, which is something that takes some time to make itself fully evident, is that Mahmood’s wife is pregnant and that her two previous pregnancies ended as stillbirths. She is consequently tormented by the traditional view that she cannot be a complete woman until she has become a mother, and her trip to Mashhad is evidently being undertaken in order to carry out religious rituals and to pray for the birth of a healthy baby. So her encounters with the village children, who are largely parentless, naturally invoke her motherly instincts, what role she can play, and her concerns about what fate may have in store for these children. The rest of the film meanders along in its own desultory fashion showing various classroom scenes with the children, which are intercut with scenes of Mahmood and Feizollah discussing aspects of the lifestyle of the region while riding together on the motorcycle across the desert. 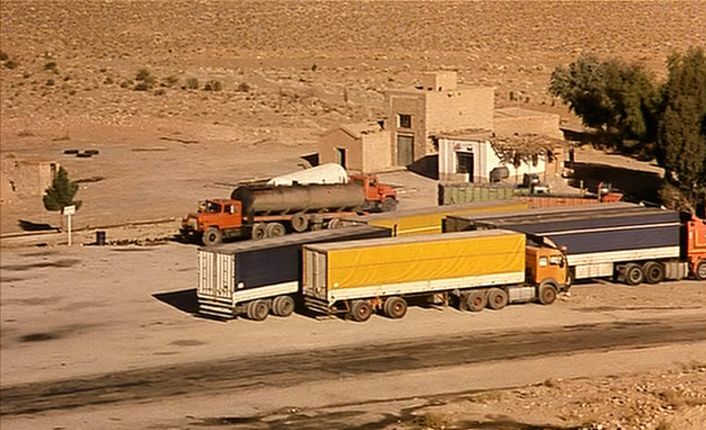 This motorcycle conversation is very reminiscent of a similar scene in Abbas Kiarostami’s The Wind Will Carry Us (1999), which is not so surprising since The Deserted Station is based on a Kiarostami story, and he is also credited, along with Kambuzia Partovi (Café Transit, aka Border Café, 2005), for the script of The Deserted Station. Another cinematic homage may have been associated with that of the elderly illiterate railroad switchman, who was the only other male besides Feizollah in the village. The man’s stubborn repetitions a minimalist set of actions and phrases evoked the similar behaviour of the switchman of an earlier well-known (and over-praised) Iranian film, Still Life (Tabiate Bijan, 1974). Gradually a philosophical metaphor begins to take shape. This little village of parentless children becomes a microcosm for the great mass of humanity who seek to know what is “out there” and important. The village teacher Feizollah is a practical man and at his own expense has devoted himself to teaching these children about the outside world. He is understood to be knowledgeable concerning many things, and for a day at least, Mahmood’s wife has become his surrogate. For these children, Feizollah, and now Mahmood's wife, are almost celestial beings who can provide guidance for their following. But what should that guidance be? In fact Mahmood’s wife knows quite a bit about the outside world that she could tell these children, but she begins to see that the some of the truly important aspects of life are right in front of us – right here and right now. 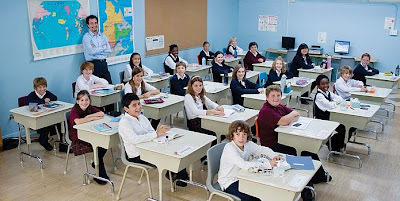 There is a scene where she is following Feizollah’s lesson plan and instructing the children about Christopher Columbus’s discovery of a new continent, facts which the children try to memorize. But we have to ask ourselves, what can these children really understand about another continent when they know very little about even the next town? Aren't there more essential things for them learn? There are further metaphors evoked when the children run to a railroad siding where some abandoned passenger cars are rusting away – the "deserted station". They use the train cars for a purpose other than for transport – they begin playing a game of hide and seek. Seeing this, Mahmood’s wife becomes pensive as she wonders perhaps where the "train of life" is taking all of them. One of the older boys wants to run away from the village in order to learn where those trains he sees, which always pass by their village without stopping, are going. Mahmood’s wife understands his longing to know about ultimate destinations, and yet she also knows that this is something that perhaps can never be really known. Thus she is torn: she wants to help these children, but how? She can only comfort them and try to imbue in them more down-to-earth truths, such as that they should support each other and not tease anyone among them who is afraid. The appearance of the deer in the desert road was a highly unlikely and somewhat miraculous event for that region of Iran. The matter-of-fact Feizollah seemed to have thought that such an appearance must have been illusion. Did this have symbolic connotations? 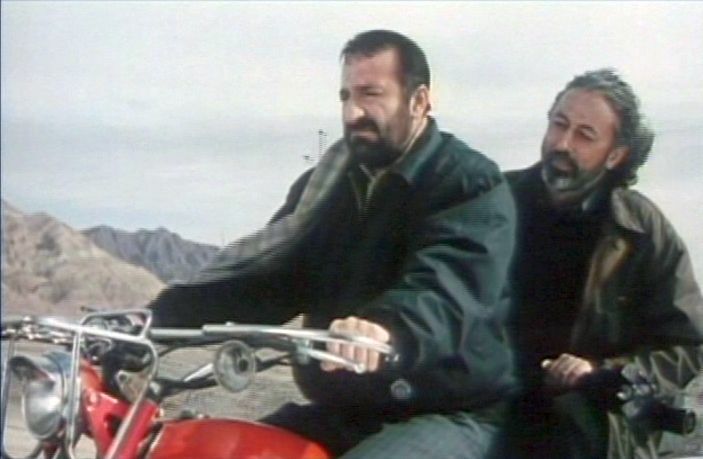 While on their motorcycle ride, Feizollah discusses his unsuccessful attempt to be elected to the Iranian parliament. There may be some social commentary about the Iranian political process embedded in their remarks. Also during their motorcycle trip, Mahmood remarks that on several occasions that day he has seen women being carted away on trucks by soldiers. Feizollah seems oblivious to these sightings. I am not sure what this discussion might mean other than to remind us that women in the Iranian countryside live very circumscribed lives. Rather than resolve these issues at the end, The Deserted Station concludes by metaphorically presenting this state of hesitation and doubt. 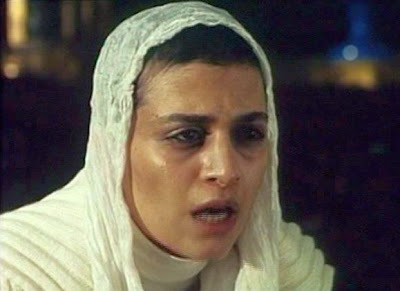 This ending seems quite artificial, but it is smoothed over by the sensitive dramatic portrayal on the part of Leila Hatami (Leila, 1996; Low Heights, 2002; A Separation”, 2011) as Mahmood’s wife, who generally sustains an appropriate contemplative mood throughout the film. In addition the music by Peyman Yazdian (The Wind Will Carry Us, 1999; The Wind Carpet, 2003; Crimson Gold, 2003; Friday's Soldiers, 2003; Fireworks Wednesday, 2006) is, as usual, effective in support of the film's reflective atmosphere. 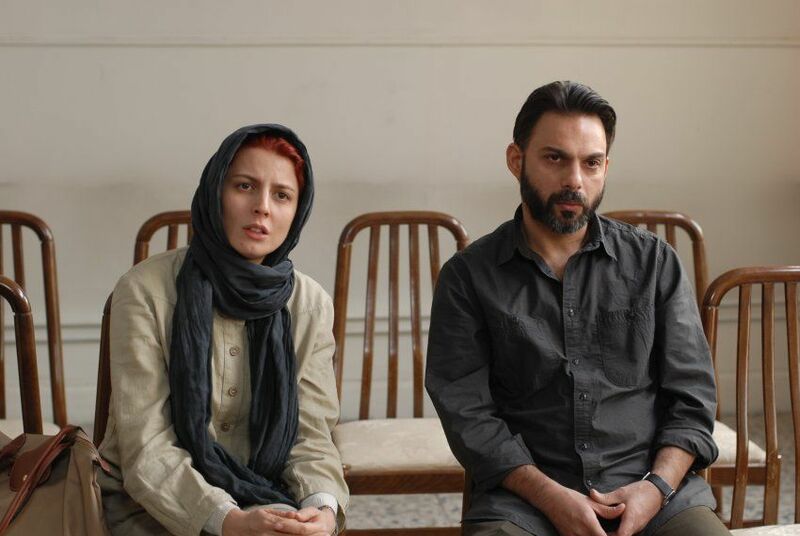 A Separation (Jodaeiye Nader az Simin, 2011) is an intense Iranian domestic drama by writer-director Asghar Farhadi (About Elly, 2009) that has drawn immense critical favor and won multiple awards. 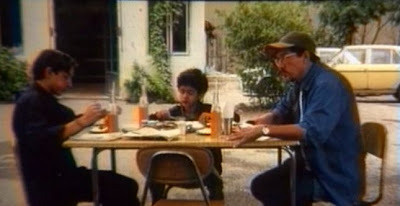 The film opens with a married couple facing directly into the camera and giving testimony concerning their application for a divorce. At first site, this looks very much like another version of Farhadi’s Fireworks Wednesday (Chaharshanbe Suri, 2006), which told a searing story of a bickering married couple and their inability to fashion a stable marriage relationship. But A Separation proves to be quite different. While both halves of the married couple in Fireworks Wednesday were unforgiving and unsympathetic characters, the married couple in A Separation, Nader and Simin, are reasonable and understandable. We can empathize with each of them and understand why they act as they do. What distinguishes them from each other, as the ensuing events will demonstrate, is that Nader is the principled idealist, while Simin is the pragmatist. Popular cultural expectations about gender roles often lead us to expect the man to be the pragmatist and the woman to be the principled idealist, but it is just the opposite in this case. There is another significant aspect of A Separation that distinguishes it from many Iranian films, indeed from most films across the international spectrum, concerning the focus of the domestic interaction. 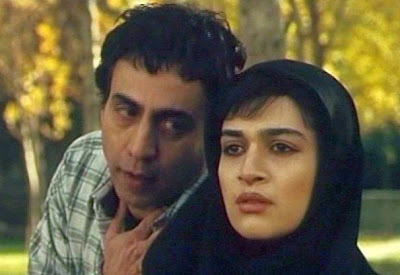 In many Iranian films, the focus is on the difficulties that women face in a conflicted and changing society that has traditionally placed severe restrictions on them. In this film, however, the primary focalization and the underlying themes that drive the narrative are centered around the husband, Nader. 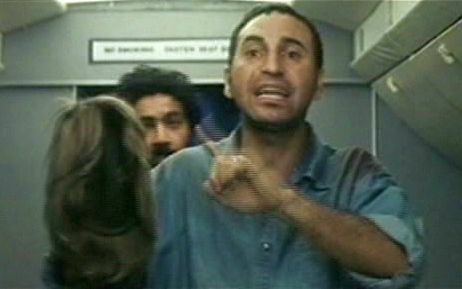 The opening scene quickly and clearly reveals the main aspects of Nader and Simin’s situation. Simin has been working diligently for a year-and-a-half to acquire a visa to some overseas country, where she expects that they can have a better life for themselves and their eleven-year-old daughter, Termeh. And now, finally, they have been granted the visa and have been given forty days in which to respond, that is, emigrate to their long-sought country abroad. 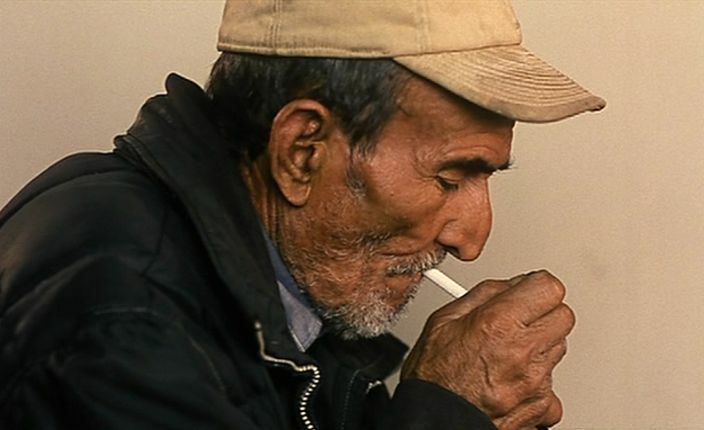 But Nader, who had originally cooperated with Simin’s efforts to emigrate, now refuses to go – he says he cannot abandon his father, whose Alzheimer’s condition requires round-the-clock care. Nader is quite willing to allow his wife to leave, but he doesn’t want to hand over custody of Termeh to Simin, and the Islamic law of Iran evidently gives the husband the authority in this situation. 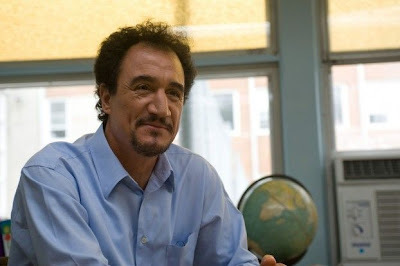 So Simin and Nader have agreed to go through uncontested divorce proceedings in preparation for a further decision in connection with who will wind up with Termeh. The magistrate listening to their divorce deposition, however, refuses to grant them a divorce, even though both Simin and Nader are in agreement about that issue. He says their reasons for seeking a divorce are insufficient for dissolving their marriage. The viewer can understand and even sympathize with the positions of both Simin and Nader. Both of them are reasonable and civilized, but they have different outlooks. Simin is practical and judges the good action by the likely beneficial consequences to come from it. For Nader, his good actions are determined by his own inner moral compass, which is not governed by externally defined rules or outcomes. This is exemplified by an exchange between Simin and Nader, when she points out to her husband that his dementia-stricken father at this point doesn’t even know that Nader is his own son. “But I know him,” Nader responds. Nader even decides to let Termeh go abroad with Simin if she chooses, but the girl decides to stick by her father at home. Simin moves out of the house, in preparation for her move abroad, and from here on, we follow what goes on at home with Nader and his daughter and father. It’s evident that Nader is a caring and thoughtful man and father, but he is clearly under stress. He has a full-time job to attend to, his wife has just left him, he has to look after his terminally ailing father, and he must look after Termeh and help her with her schoolwork. This stress and pressure on Nader will only intensify as the narrative progresses. Nader proceeds to hire a caretaker woman, Razieh, to look after his father while he is away at work during the day. Razieh comes from a conservative, lower-class background and is hesitant about the moral implications of being alone at home with another man, even if that man is almost insensate with dementia. But with her husband unable to find work, she desperately needs the money and goes ahead with the job. Not long after Razieh starts work, Nader comes home early one day and finds Razieh away from the house and his father half-dead on the floor of his bedroom, with his hands tied to the bedposts. Razieh had tied the old man up to the bed and had gone out to attend to some other chores. In her absence, the father had fallen out of bed, leaving him in a precarious, immobile position on the floor. Nader manages to revive his father, but he is still very disturbed about Razieh’s neglect. He retains his composure, but his stress level has increased markedly. When Razieh returns to the apartment shortly thereafter, Nader confronts her with what has happened to his father and the fact that some money has been taken from his bureau. He dismisses Razieh on the spot and orders her out of the house. Razieh protests her innocence about the missing money and refuses to leave the apartment, so Nader pushes her out the door and locks it. The seemingly minor act of pushing Razieh out the door turns out to be a major event and brings woe to everyone. Nader soon learns that Razieh was pregnant and had a miscarriage. She charges Nader with assault, because she says she fell down the stairway leading up to his apartment when she was pushed out the door. Nader expresses his sorrow and sympathy for what happened, but asserts that he is innocent of the assault charge. Because Razieh was 19-weeks pregnant, Nader learns that he can be charged with murder and be sentenced to prison for up to three years. A key issue is whether Nader knew that Razieh was pregnant when he pushed her out the door. If he did, then the law says he is culpable for a murder. The rest of the film revolves around unraveling what happened when Nader nudged Razieh out the door. Did she really fall down the stairs (the viewer doesn’t see it)? Did the alleged fall cause the miscarriage, or was there some other incident at that time? Did Nader really know about Razieh’s pregnancy? We viewers knew, but Nader swears he did not, and we are moved to take Nader at his word. Little scraps of evidence come out here and there. All the way along, we are looking to see if Nader will be found guilty of the charge. We are also judging Nader, ourselves, along with Termeh, according to our own moral compasses. A key moment in the story occurs when Termeh confronts Nader with her doubts about whether he knew about Razieh’s pregnancy before the shoving – there are inconsistencies in what Nader testified to the authorities. 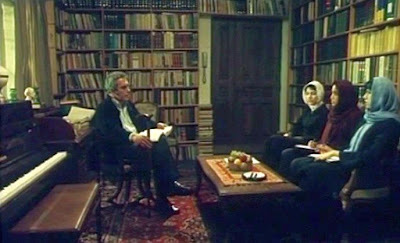 With his integrity as a parent on the line, Nader confesses to Termeh that he did know about Razieh’s pregnancy before the act. But he denied knowing to the authorities, because the rigidity of the law doesn’t take into account the fact that at the moment of his nudging her out the door, he was not mindful of her condition. He knew, and yet he didn’t know, he tells Termeh. According to the letter of the law and according to the strict, conservative moral code followed by Razieh and her husband Hodjiat, Nader is a liar and guilty of a crime. But Nader tells Termeh that he still believes he is innocent of the crime of murder, but the rigidity of the law compelled him to cover up his foreknowledge of Razieh’s pregnancy. Termeh is anguished to hear this, but stands loyally behind her father’s testimony when she is interrogated by the authorities. The pragmatic Simin reenters the situation and tries to come up with a practical solution. If they are willing to pay a diyya (“blood money”) of 40 million tomans (about US$ 40,000) to Razieh and Hodjiat, Nader can avoid going to jail. Simin approaches Razieh and Hodjiat and gets them to agree to a payment of 15 million tomans. If Nader confesses to the crime and pays the blood money, he can avoid going to jail. But Nader doesn’t go along with this arrangement, because it would entail his admission that he committed murder. He believes in his own innocence. 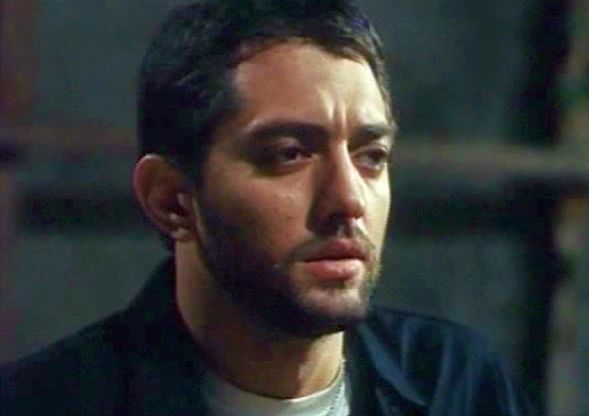 The acting in A Separation is very good, particularly that of Peyman Maadi in the role of Nader. 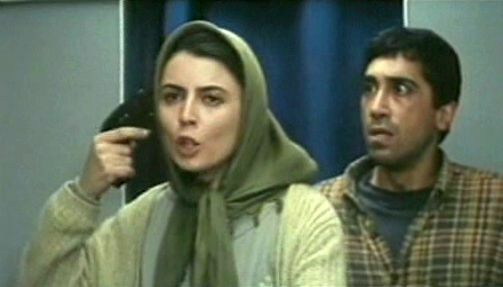 Indeed all of the performers, including Leila Hatami (Leila, 1998; Low Heights, 2002), give convincing and subtle performances . On the other hand, the shaky hand-held cinematography in the film is a distraction and an irritation. Farhadi has chosen to track his players in closeup and medium closeup as they move around the setting. Such close-in filming requires an extremely steady camera, particularly when the character movement stops and slight movements of what are supposed to be static images are more noticeable. Unfortunately this kind of steady image control is not what we get in A Separation. 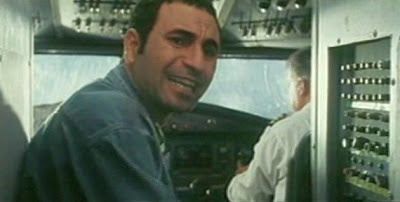 As I mentioned above, there are two judgement examinations of Nader’s behaviour going on in parallel in the film: the official legal case conducted by the civil authorities, and our own private assessment. The ingenue Termeh acts as something of a surrogate for our own assessment of Nader: she knows as much as the viewer and also sympathizes with both parents. At the end of the film, the official examination by the civil authorities is resolved, but Farhadi chooses to leave Termeh’s own, personal assessment open. Termeh is asked at the end of the film to choose between two different ways of looking at the world: that of Simin or that of Nader. Both of them are more flexible and complex than the strict moral bookkeeping characteristic of conservative societies, but they have differing outlooks. I believe I know which one Termeh chooses, do you? An earlier version of this review contained an erroneous mention here of Niki Karimi. 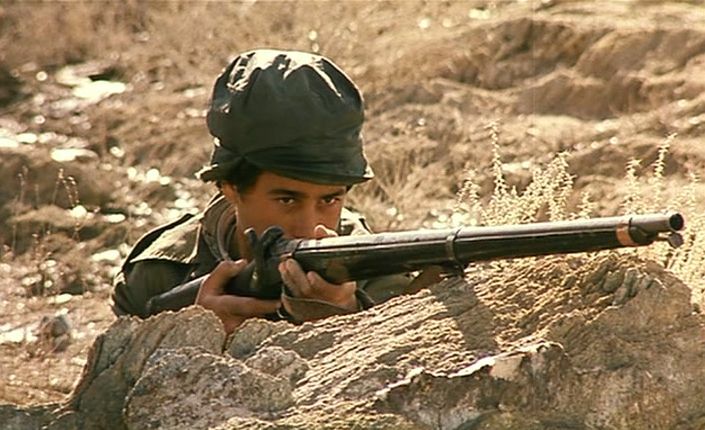 Friday’s Soldiers (Sarbaz-haye Jome, 2004), by well-known Iranian writer-director Masoud Kimiai (Gheisar, 1969; The Deer, 1974), offers another example of the popular revenge motif. As is characteristic of the genre that helped make Clint Eastwood famous, much of the film depicts some gross and cruel injustices that are suffered by the protagonists, who then render a bone-crunching payback to the wicked perpetrators in the closing scenes. 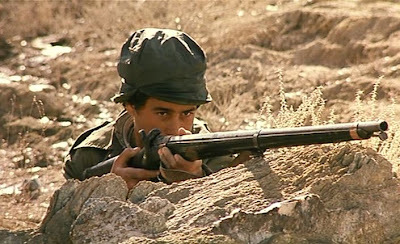 This particular revenge story concerns the events around one particular weekend when some young Iranian soldiers get a weekend pass to visit the “outside”. The story passes through five distinct stages: the introductory scene, three scenes that depict the poisonous state of their society, and finally the cathartic conclusion. We are introduced to three of the four principal protagonists in this scene. Asef is a new recruit who chooses to install his belongings in the lower bunk of a bed, the upper bunk portion of which is occupied by Reza. 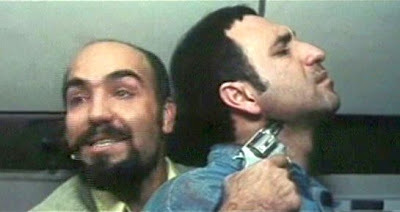 Reza resents the sent of Asef’s eau de Cologne (signifying Asef’s higher class status) and thuggishly challenges him. A bloody fistfight ensues, after which the two are hauled before their gray-haired superior, the “sergeant”. Despite the brutality of their fight, Reza and Asef dismiss the whole thing as a little macho-laden dustup, and soon they become friends. Together with another conscripted soldier, Saeed, who wishes nothing more than to leave the army and the country altogether, they all decide to go on a weekend leave. The sergeant also decides to join them, and they set off on their outing. Reza wishes to visit his ailing mother, but upon arrival he learns that she has already passed away and the mourning is already underway. He learns that his elderly father had neglected and presumably antagonized the ailing mother by recently taking on a young sighe (temporary additional wife). Reza’s sister has just murdered her abusive, drug-addicted husband and will face a cruel justice. 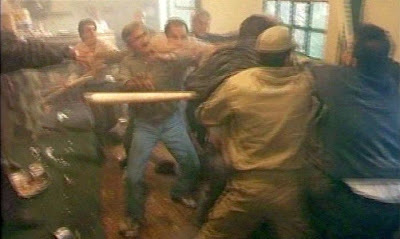 After the agony of much wailing and multiple revelations and recriminations, the four soldiers leave Reza’s residence and are joined by Reza’s brother. The group now visits the sergeant’s home, where a young female family member is apparently suffering from epilepsy. Asef watches the girl’s fit in horror and is evidently disturbed that the girl is likely doomed to be treated as a social embarrassment. After a stopover to observe Reza’s brother at a recording studio session, the group, now joined by Asef’s sister, Noghre, go to Asef’s luxurious family residence. The class difference separating Asef from his companions is clearly on display in this scene. 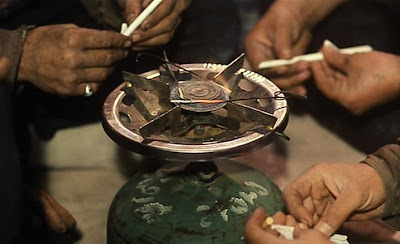 This sequence, the longest in the film, is centered around Noghre, a beautiful, educated woman who has recently descended into drug addiction. Asef urges her to abandon drugs and return to a normal life, but she tells him that her drug addiction stems from despair over the murder of her beloved, a well-known professor famous for his knowledge of poetry and philosophy. The professor was murdered, we eventually learn, by a jealous young gangster who lusted after the beautiful Noghre. The depraved gangster then took advantage of the grief-stricken Noghre’s resulting weakness over her lover’s death and got her enmeshed her in drug addiction, his own professional specialty. When our “Friday’s Soldiers” learn about this, they immediately commit themselves to taking revenge on the entire gang. 5. Revenge at the Slaughterhouse. The four young men and the sergeant equip themselves with clubs and then get Noghre to guide them to the gang’s headquarters at the slaughterhouse. As soon as they arrive, they start knocking heads, and the next two minutes of screen time show a blood-spattering melee, with the Friday’s Soldiers barely holding their own. They eventually succeed in their mission, though, and they all head back to the barracks to get aid for seriously wounded Saeed. However, the closing shots of the film show the soldiers’ return impeded by a political demonstration that is underway in the city, as the big city seems to swallow up the soldiers and their concerns as if they hold no significance. Overall, Friday’s Soldiers has serious weaknesses, and yet there are some attractive features to it, too. On the down side, the narrative lacks coherence, and the middle three acts to the film come across as random and disconnected. The acting in the film also has serious limitations, with overwrought histrionics substituting for serious dramatics. 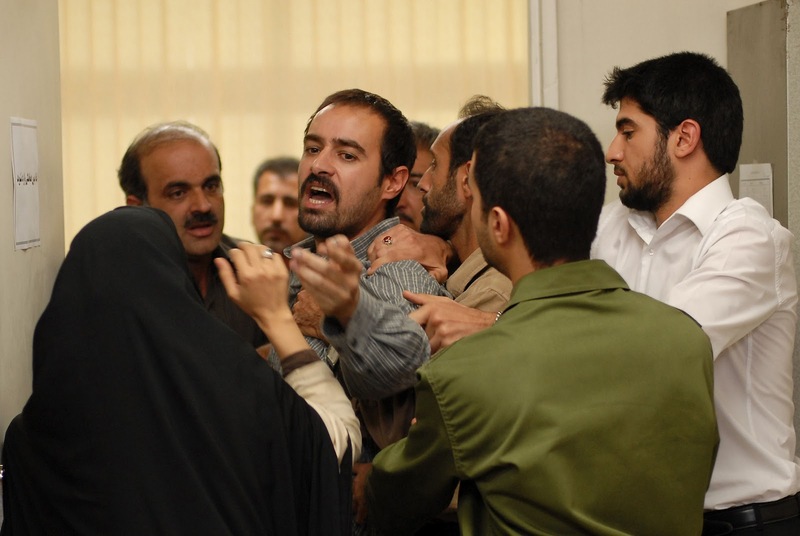 This difficulty is exacerbated by Iranian social custom, which is typically highly emotive in many social situations, such as during grieving periods after a family death. Thus the emotional scene at Reza’s place, with all its crying and wailing, seems artificially overwrought, insincere, and unconvincing. Despite the overall mess of the story, however, the over-the-top, impressionistic images presented here have their mysterious upside, too. They turn the film into a weird impressionistic phantasmagoria that plays according to its own mad logic. This is particularly effective in the lengthy fourth act, “Asef’s Place”, where Noghre’s half-crazed recounting of her tragic descent begins to take over the entire film. Her story begins to infuse the film with an overall theme. These soldiers, for various reasons dropouts from their particular social circumstances and from Iranian society as a whole, couldn’t deal with all the contradictions and dissatisfactions in their lives. But once they hear Noghre’s story, they have had enough; they resolve to stay and fight for justice. Although the word “Friday” in the title may merely suggest that this is the last day of their brief weekend pass, it can also can carry the connotation of the Islamic holy day, the day of peace and mercy. These “Friday’s Soldiers” see a society around them that is in decay, and action must be taken to set it aright. The expressionistic cinematography emphasizes their emotional turmoil by constantly inserting reaction shots of the protagonists, as they watch and react to one horror after another. Unfortunately, such a moral interpretation of Friday’s Soldiers is undercut by the final, violent action of revenge. Thrashing and stomping on those who are judged to commit wrong will not solve the problems in society; it merely perpetuates the cycle of hatred and violent reaction. All revenge films suffer from this basic moral discrepancy. Such violent "retribution" may supply some visceral satisfaction, but it is only a primitive, animalistic response. One final word needs to be said, however, in appreciation of the haunting, moody musical score by Peyman Yazdanian, who also scored the music for The Wind Will Carry Us (1999), Going By (2001), and Fireworks Wednesday (2006). It’s so good that it alone elevates my rating of the film by half a star. A man and his young son of about eight or nine years of age. The son appears healthy, but we are told that he will soon die of the same strain of cancer that killed his mother two years earlier. A man driving a hearse, with a passenger who is a peasant man in his forties. Their cargo in the back of the hearse is the corpse of the passenger’s 92-year-old father. Two women in another car. The driver is a young widow whose husband recently died of cancer one month earlier. The passenger was the dead husband’s lover and was unknown to the widow prior to her unwelcome appearance at the recent funeral. A father and his two sons, one about 8 or 9, and the other in his late teens. The father is concerned about the life prospects of both sons. The younger one has just recently failed his year in school, and the older one has aspirations towards the not-very lucrative career of a film critic (Karimi’s original profession). As the film proceeds, the viewer is naturally motivated to see what may connect the four groups. This takes time, though, because there is the oft-used technique of slow disclosure at work here, where significant pieces of information are only revealed in tantalizing bits and pieces during the lengthy car journeys (the film mostly consists of dialogue among the excursionists). Given the serious life issues associated with the four groups and the likelihood that the journey will be a driving metaphor of the narrative, one looks for kind of allegorical overtones that often appear in serious Iranian films. 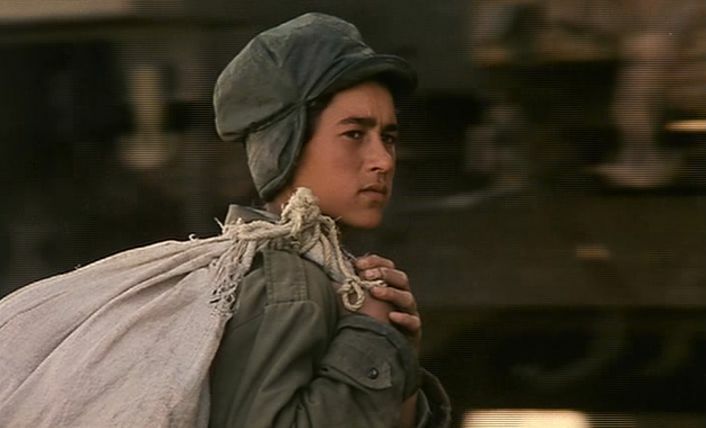 Indeed there appear to be affinities between this film and those of Abbas Kiarostami, for example, The Wind Will Carry Us (1999), which also depicts travelers on something of a spiritual quest. This connection is likely no accident, given the fact that writer-director Karimi wrote a book about Kiarostami, (Abbas Kiarostami, the Realist Filmmaker). In fact in the early stages of the film, we see a film crew at work photographing a scene involving that same hearse (one of the four vehicles to be followed for the remainder of the film). At this point the viewer may wonder if he or she is about to see the sort of reflexive narrative that Kiarostami sometimes uses to show the filmmaker at work making the very film that one is watching. In this case, though, this filmmaking depicted early on in Going By appears to be part of the fictive story and not a direct diegetic reference to Karimi’s own filmmaking. Nevertheless, Karimi’s narrative does seem to try to maintain a certain ambiguity about the narrative process throughout, with reflexive insinuations scattered all the way along. There are continual references to filmmaking and film criticism in the story, and there are several discussions among the participants concerning the differences between realism and fantasy in both art and films. There are also some clearly symbolic gestures in the film. For example, an elderly man with a tire is occasionally seen along the side of the road, and he is sometimes seen attempting to hitchhike with it to some unknown destination. At other time he is seen rolling the tire down the run and running along rapidly behind it. Perhaps he represents the never-ending and mindless flow of time that drives us towards our fatal destinies, but one is only left to draw his or her own conclusions about what it all means. 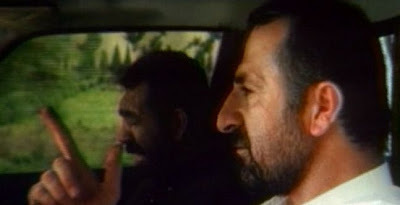 In addition, the hearse driver serves as something of a Greek chorus in connection with the film’s assumed themes of fate and death. At one point the driver philosophically remarks that there is a significant difference between the professions of acting and driving a hearse. Acting, he says, inherently involves a degree of love and dedication; while hearse-driving is just a job. This suggests that unless we are somehow passionately and lovingly involved in life, we are, each of us, just doing the routine "job" of driving our own hearse (that is, our own body), towards our own eventual funeral. This, for me, was the one moment of revelation in the film. With those various philosophical allusions and intimations always present, there is promising material here, but unfortunately, “Going By” doesn’t live up to its promising expectations. There are a number of serious weaknesses. For one thing the acting in the film has some serious limitations and inconsistencies. Only the boisterous hearse-driver seems to project a real character. The other actors seem woefully inadequate to the dramatic demands of their roles, which may reflect Karimi’s inexperience. Other film directors who have used amateur and first-time actors have evidently restrained the narrative demands made on the performers so that the acting stayed within believable bounds. But this was not the case for the players in Going By, many of whom are dealing with bereavement and other serious emotional concerns, and this leads to a disappointing dramatic result. There are also some noticeable technical inconsistencies with lighting and editing continuity in the film. These rough edges are unfortunately made more conspicuous by the explicit discussions in the film by some of the characters about techniques of sound dubbing, back-projection, and realism, which call attention to the technical details of the production. Of greater concern is the fact that each of the four groups should have its own narrative direction and movement. But this doesn’t happen. Each of those groups just drifts along aimlessly. The man with the doomed son seems distracted, occasionally showing interest in his son or the young widow, and at other times drifting away into his own world. The father-and-two-sons subnarrative is just a long argument littered with scatological dialogue. The hearse-driver subnarrative is not a subnarrative at all and goes nowhere. Only the subnarrative of the two women shows some movement, but it’s all rather quizzical. Why are we prevented from seeing the dead husband’s paramour for almost half of the film (she is frequently just out of frame)? Why does the young widow run away and abandon her car to the paramour at the end of the film? The four groups do finally come together at a road café on their journey to the north. But though there is some teasing interaction among the travellers, there are no serious connections made. There had been a discussion along the way about the difference between landscape painting and portraiture, and this is explicitly brought to our attention at the café, but whatever point Karimi seems to be making on that score was lost on me. At the end of Going By, there has been no resolution made at the narrative level or at the thematic level. It all just comes to an inconclusive ending when the final credits roll on the screen.